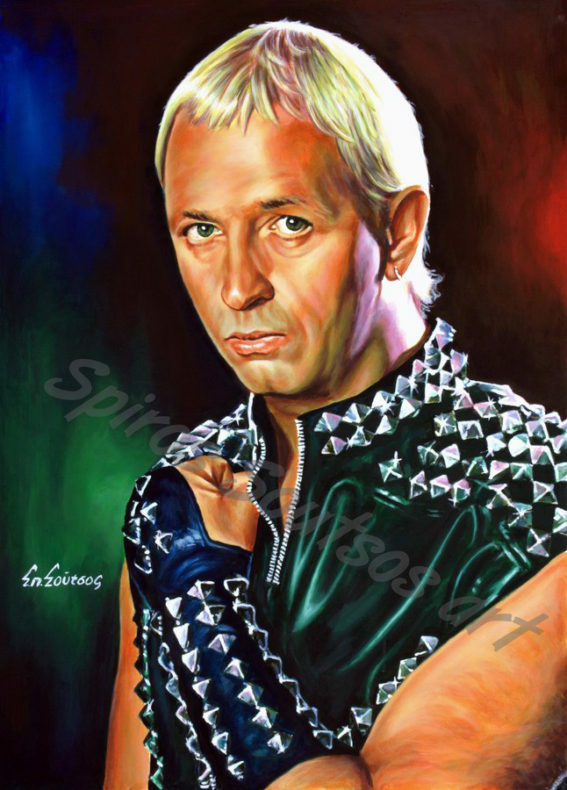 Rob Halford (Robert John Arthur) was born in 25 August 1951. He is an English singer-songwriter, who is best known as the lead vocalist for the Judas Priest, the heavy metal band that has sold over 45 million albums to date. In Birmingham, Halford co-founded Judas Priest with the bass guitarist Ian Hill. Halford who was a former cinema manager, joined the band as singer, bringing with him drummer John Hinch from his previous band, Hiroshima. The two other members of the band were the guitarists K.K Downing and Glen Tipton. The band debuted with the single “Rocka Rolla“in August 1974, before releasing an album of the same name a month later. The second album was the heavy metal masterpiece Sad Wings of Destiny (1976) and next were 1977’s Sin After Sin, 1978’s Stained Class and Killing Machine (released in America as Hell Bent for Leather). This point heralded the first style change when Halford (and Priest) shifted from gothic style robes to a leather and studs image. 1979 brought their first live recording with the now classic Unleashed in the East. In 1980, the band released British Steel. The songs were shorter and more concisely structured, but retained the heavy metal feel. They released Point of Entry in 1981, featuring the song “Heading Out to the Highway”. The 1982 album Screaming for Vengeance had a song, “You’ve Got Another Thing Comin'”, which garnered strong US radio airplay, and the popular follow-up Defenders of the Faith was released in 1984. Turbo was released in April 1986, during the glam metal era. In May 1988, Ram It Down (which was supposedly the 2nd half of “Turbo”) was released, with songs that were also recorded during the “Turbo” sessions. In 1990, Painkiller was released, one of the most powerful and influential heavy metal albums of 1990’s. Along with a change in musical style, the band’s look changed as well. Halford emerged with all-new tattoos, and began shaving his head for the first time, claiming that his receding hairline was getting annoying to keep up with. After spending nearly 20 years and recording 12 studio and two concert albums with Judas Priest, Halford left the band in May 1992. He was involved with several side projects, including Fight, 2wo and Halford. In July 2003, Halford returned to his former band, and they released Angel of Retribution in 2005, Nostradamus in 2008 and Redeemer of Souls in 2014.